We had to let magnificent Bronx, our F1 Bengal, go this week. Being treated for hyperthyroid disease, we had concern why he still wasn’t gaining weight and being picky with food. We’re so thankful for our caretakers who knew he wasn’t acting like himself. That’s often hard to tell since Bronx was an unsocialized cat, rarely allowing himself to interact with people. His vet exam showed his thyroid was in normal range. But we also found a large mass surrounding his esophagus. We had no choice but to help him move on to his new wild life. Arriving at TWS almost 17 years ago, Bronx and his brother Phoenix had many years showered with treats, toys, heated and comfy areas to sleep and plenty of outdoor space to stretch their wild side. But life could’ve ended very differently for them. They were imported from Malaysia to New York to be used for breeding Bengals – what a shock when the buyer found out they were both males! They were seized by authorities and were supposed to come to TWS at that time. Instead, they knew a veterinarian in Arizona who wanted to try to socialize them and were flown there. After several months, we were again contacted asking if we could still accommodate them. They weren’t using a litter box and they wanted no human contact at all. We of course said yes, and welcomed them to their forever home. Because of their travels to New York and Arizona, we named them Phoenix and Bronx. Both brothers remained very feral for several years. Bronx was the shy bombshell beauty with aqua eyes. He was often found following his brother’s lead. Phoenix was the more outgoing of the two, but also very shy. It was difficult to capture their beauty in photos because, when humans appeared, they’d run back into a cat condo or under a perch. But, as they got used to their human caregivers, they eventually would stay out on their platforms when breakfast arrived. Even sometimes taking treats from our hands. Bronx was dependent on Phoenix. So, if one of the two brothers had to leave us this way, it happened in the right order. It would’ve been difficult for Bronx if it had been Phoenix passing first. Bronx will be met by our pride on the other side and have plenty of support he needs. And Phoenix will accept other friends. But knowing their special bond, it was important for us to put Bronx back in with Phoenix after his passing. We wanted Phoenix to understand, in his own way, what happened. But in my heart, I know Phoenix already knew. Animals are far more intuitive and open minded than we are. And the ones who are closer to their wild cousins tend to be even more sensitive. It can be challenging spending 17 years with a cat that prefers the company of their own kind, especially the small ones. Our hearts want to hug, cuddle and wrap ourselves around them. But that’s us, not them. Instead, we spent 17 years respecting the needs and desires of Bronx. Sometimes that had to be from afar. But that’s what we do here. It’s about them. It’s always about them. Bronx, you are loved by your brother Phoenix, and so many more than you’ll ever know. We respected your space and who you were. May you enjoy your wild side – it’s who you were. We love you. Bronx is a first generation (F1) Bengal hybrid, meaning one of his parents was an Asian Leopard Cat and the other was a Bengal Domestic Cat. Bronx and his brother, Phoenix, were imported from Malaysia to New York. Bronx was born in 2001. Within the first year, authorities seized the pair. 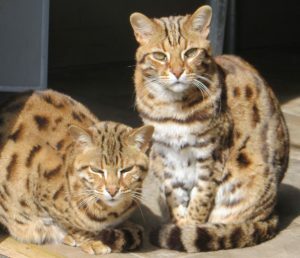 The owner said he had imported them to breed and make money selling small exotic cats. Little did he know, he had been sent two male cats. The authorities contacted TWS to take in the two brothers in 2004. Both cats are absolutely gorgeous, but very unsocialized to humans. They live together with other hybrids and domestic Bengals and get along wonderfully. They choose not to want human contact but will accept our presence as long as we have a feather toy in hand. You can help provide daily care for Bronx by sponsoring him today. Your help will be greatly appreciated.